Snack-Girl has been on the hunt for yogurt that makes her heart flutter. A yogurt so good that she wouldn't even miss ice cream. Is it possible? After writing a few weeks ago about Chobani, I followed the advice of my readers and tried FAGE. FAGE, pronounced Fa-yeh!, is absolutely delicious. There were many comments on Chobani that forced me to spend the $2 for the yogurt pictured here. Two dollars!! Chobani costs one dollar, and Yoplait Strawberry Yogurt costs a mere 80 cents. What could be SO great about FAGE? Well, the taste and consistency of this yogurt is dreamy. I took some out of the plain container and just added a teaspoon of maple syrup for my morning snack. My DIY Yogurt preparation amazed me. I only ate half of the package (3.5 ounces or 65 calories) - add 20 or so for the syrup and you have an INCREDIBLE healthy snack for less than 100 calories. Also, I only ate half the container and was satisfied - so I only spent $1 and I can save the rest for tomorrow. The only sad part is that the container doesn't allow me to seal it up so I'm going to have to use a plastic bag. You can find a 50 cents off coupon on their website FAGE USA. You will also find out how they make their yogurt. It takes 4 pounds of raw milk to make one pound of FAGE yogurt, which is probably why it costs so much. Sometimes you get what you pay for and I believe this is a good example of how spending more gets you something MUCH better than the average. Also, it forces you to savor what you are eating instead of just taking for granted the food in front of you. FAGE has no high fructose corn syrup, stabilizers, artificial colors, and it tastes great and guess what? it costs more than twice as much than Yoplait Strawberry Yogurt. My advice is to eat less of a good thing if that is what you can afford. There are flavors of FAGE. They had the idea to allow YOU to mix in the added ingredients (not unlike DIY Yogurt). I haven't tried them, but I love the idea that you can adjust the amount of added sugar by just adding less of the honey or jam in the package. 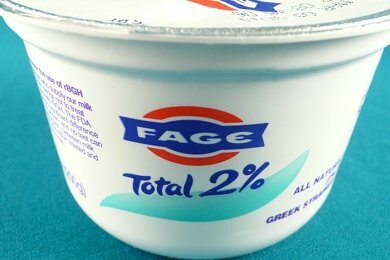 Have any of you tried FAGE? Do you like it as much as ice cream? Please share. Fage is the best greek yogurt in my opinion. If I am going with plain greek yogurt, then I only use Fage. I really like to mix it with a bit of maple syrup for a caramel-like flavor. I also use it as a sub for sour cream. For flavored greek yogurt or if I'm using it in a recipe (like a dip, baked good, or smoothie), my favorite is Stonyfield's Oikos because of the price. Once you add in the flavor or put in a recipe, Fage's best traits are hidden, so it's not worth the money then. That's a good one. You can also start your day with Fiber One cereal and tons of fruit. The end result: weight loss and much less desire for ice cream. The reason: the fruit is so sweet that ice cream becomes unnecessary. I made my latest batch of yogurt with a greek yogurt starter and the yogurt I made is just like the yogurt I started with. Unbelievably thick and luscious - so creamy. Yum. And affordable. I love Greek yogurt. In fact, last night, I subbed yogurt for ice cream and made a parfait -simply plain yogurt, frozen cherries (thawed) and a drizzle of honey. YUM. Cheater hint: You can make Greek-style yogurt yourself by placing regular plain yogurt in cheesecloth, and tying the cheesecloth so that it's suspended above a bowl. Allow to drip for an hour or so, and the resulting yogurt will be much thicker and creamier. Ta-da! I've never had that kind of yogurt before. Does it taste just as good as Yoplait? Like I already posted on the Chobani thread, I get my Fage at Trader Joe's. They (the one I go to anyway) carries the bigger size and it is much more affordable than buying the little ones. I also agree with Candice who commented on the Stonyfield's Oikos. Look at the protein content on that one, it is a good one if feeding to kids. Fage is great, I personally like Trader Joes brand Greek Yogurt (if you have one in your area). It's just as good and a little cheaper. I am a registered dietitian, and think greek yogurt is SO much healthier than regular because of the high protein conent and low sugar. Plus, it's yummy with some fresh fruit and low-fat homemade granola. I eat it every morning! I don't know about "as good as ice cream" but I've eaten 0% Fage every morning for several years now. In the summer I go to farmers markets and stir in fresh berries. Over the winter I mix in homemade granola. It's the best. I also add a small amount of honey or one Splenda to even out the tartness. In Chicago you can buy Fage at all the mainstream supermarkets now, but it's so popular that sometimes they run completely out. Especially the 0% one. Has anyone ever tried Rachel's Organic Greek Style yogurt? I recently found it at my grocery in the UK, Waitrose, and the honey flavour is to DIE for. I'm having trouble decoding some of the nutritional information though, and can't tell if it's as healthy as other Greek yogurts. It has 3.3g of protein per 100g, and 12.7g per 100g, 12.7g of which are sugar. Is this average? Grab some walnuts, Fage and honey. You couldn't ask for a more nutritious meal. Your getting Omega 3's, antioxidants, calcium, live cultures and much much more. It's the perfect meal. I love this yogurt, lots of protein. I get it at Costco for $6 for a tub. I make smoothies with it in the summer: a little oj, a bunch of baby carrots and spinach, some frozen fruit, a banana and two big spoonfulls of this yogurt. I blend it and my kids drink it up and ask for more! do the carrots blend up well or do they leave chunks? @ Jennifer- which city/state are you in? I haven't seen it at my local Costco. All I can find at mine is Mountain High yogurt in the big tub. Also, how "big" of a size is it? I did find the like 18 oz. at TJ's and it was much less than $6, so I am thinking you also found a bigger size. Would love to know where. Thanks. I found the FAGE a few weeks ago, first at Costco that sells a large container of the FAGE 0%, then at my regular grocery store they have also a very limited selection, I've been getting the FAGE 2% (because that is all they have). I've been eating about 1/2 cup of this stuff for breakfast each day. I add a little sf vanilla syrup then peanut butter or berries and YUM! I totally look forward to breakfast! Thanks Snack Girl! So after reading this article, I decided to keep my eyes open for Fage and Oh My Word!!! How friggin fantastic this stuff tastes! First I tried the plain with some honey and wow delicious, then I bought the strawberry and peach and ate them both the same day, one for breakfast and one for dessert and I'm so happy. Thanks! As a fellow Grk, Fage is the most authentic Greek yogurt out there! Steve, you are right on about adding walnuts and honey (it's a classic Grk snack that I"m addicted to). I prefer the 2% (as I do w/ my milk) because its not as thick or tart as 100% or as 'watery' as 0%. Fage doesn't remind me of ice cream so much as it reminds me of a delicate mousse. I absolutely love it. To the commenter who asked if it was as good as Yoplait I'd say I consider it better, but it's a different consistency and taste. It feels much lighter than non-greek yogurt and I appreciate that I can control the amount of flavor I put in. Georgia (April 8, 2010) - I am with you on Fage 2%, and for the same reasons. But I don't like any sweet yogurt. My favorite summer lunch: diced seedless cucumber, mixed with some dill into a small container of plain 2% Fage. Garlic is optional. Try, you will love it on a hot day!